Fiat-free Italy … just the way I like it. The Cinque Terre—as this stretch of five towns along the Italian Riviera is called—is located in northern Italy between Pisa and Genoa, and it’s the lowbrow, under-appreciated alternative to the French Riviera. There’s not a museum in sight, just sun, sea, sand (well, pebbles), wine, swimming, hiking, and pure, unadulterated Italy. Each town fills a ravine with a lazy hive of human activity—callused locals and sunburned visitors. While the Cinque Terre is now well discovered, I’ve never seen happier, more relaxed travelers. 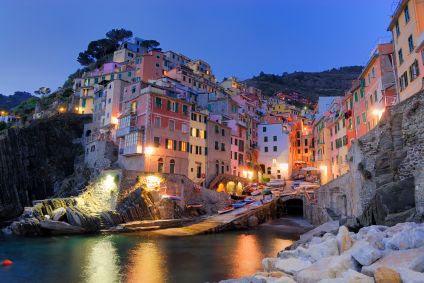 To preserve the Cinque Terre’s natural and cultural wonders, Italy has declared the region a park—towns and all. Visitors buy a $7.50 day pass to hike the scenic trail that laces together the unique communities. Riomaggiore—the most substantial non-resort of the five towns—is a fascinating tangle of pastel homes that lean on each other like drunken sailors. A cliff-hanging trail leads from the beach to old Nazi bunkers and a hilltop botanical garden. The next town, tiny Manarola, is a tumble of buildings bunny-hopping down its ravine to the harbor. You can hike up to Punta Bonfiglio—for a bar on a bluff between the cemetery and the sea—or enjoy tasty treats born right here: pesto on your focaccia, washed down by crisp local wine sprinkled with Mediterranean twinkles. Talk about going local. Corniglia, with its mellow main square, is the quiet town—the only one of the five not on the water. From the train station, a footpath zigzags up nearly 400 stairs to the hilltop town. According to legend, a Roman farmer originally settled Corniglia, naming it for his mother, Cornelia, which is how Corniglia is pronounced in Italian. Residents claim Cornelia’s son produced a wine so famous that vases found at Pompeii touted its virtues. Still, today, wine remains the town’s lifeblood. Following the pungent smell of ripe grapes into an alley cellar, I find a local who lets me dip a straw into her keg. With the closest thing to a natural harbor—overseen by a ruined castle and an old church—Vernazza is the jewel of the Cinque Terre. Its action is at the harbor, where you’ll find restaurants, a bar hanging off the edge of the castle, a breakwater with a promenade, and a tailgate-party street market every Tuesday morning. While the old men putter with their tough little boats, the day’s last bit of sunshine seems to sweep the old women and children into a warm corner in front of the church. Leisure time is devoted to the passeggiata (evening stroll), as locals do their vasca (laps), wandering lazily together up and down the main street. After three days in town—sitting on a bench, gelato in hand, enjoying the endless “ciaos” and parade of neighbors—I feel a part of the scene. I cap my Cinque Terre days on the breakwater with a glass of sciacchetra dessert wine. At midnight, the Mediterranean is darker than the sky—except for bobbing lanterns on the horizon. By night, old-school fishermen are seducing anchovies into their nets. By day, the same guys are seducing me with a way of life that refuses to give in to the modern world.